Actress Ayanda Borotho may be an elegant modern woman, but she is still very much in touch with her culture. 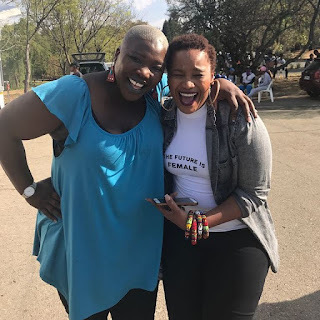 The Isibaya star says she has a “zero English policy” in her house and believes the language is not a measure of intelligence. Borotho, who is popular for playing Phumelele, the down- to-earth wife of Mpiyakhe Zungu on the Mzansi Magic telenovela, took to social media to share her views on language. Although she went to a Model C school, Borotho says she never spoke English at home and she wants her children to do the same. She said speaking English erodes one’s mother tongue, something she noticed with her son after he started nursery school. She said this freaked her out and she decided to delay nursery school for him. “All my kids speak proper Sotho and Zulu. It's their default language,” She wrote on social media, “the little English my boys know they have picked up from cartoons on T.V (which we also limit for this very reason). She went on to add that black people should preserve their languages as they represent who they are as a people. “Language is our first point of connection with who we are. There's so much of our identity as 'a people' that is imbedded in our languages,” she added. “The truth is, when these kids come of age (early 20s) and are grappling with identity, which we all go through at some stage, they will blame us for robbing them of a very core and intimate part of who they are and of one that connects them with who we are to them.